While a MBA is certainly sufficient for the majority of business jobs, having a PhD in International Business can lead to even greater career opportunities and financial rewards. On average those with a Master’s Degree earn $1,380 per week, while those with a Doctorate earn $1,664. Doctoral students in International Business can also move into the fields of consulting or academia. According to the Bureau of Labor Statistics, employment of postsecondary teachers is projected to grow 13 percent by 2024, with the average post-secondary business teacher earning an average of $96,770. To begin our search for the Top 15 International Business PhD’s we took a broad approach, namely the 786 business schools in 53 countries that have earned Accreditation through the Association to Advance Collegiate Schools of Business (AACSB) International. From there, we narrowed the field to only those schools in the continental United States that offered International Business as a concentration for their Doctoral Program. The universities were then ordered using the U.S. News and World Report rankings. Preference was given to schools with federal designation as Centers for International Business Education and Research (CIBER).Other factors considered were class size, tuition, acceptance rate, financial aid, and reputation. While Harvard University was established in 1636 (and is the oldest institution of higher education in the United States), the Harvard Graduate School of Business Administration was only founded in 1908. An accredited member of the AACSB, Harvard School of Business offers eight full-time PhD or DBA degree programs, including a PhD in Business Economics with a specialization in International Business. U.S. News and World Report ranks Harvard University #1 (tied) for Best Graduate Business Schools, #2 for Best Graduate International Business Programs, #1 for Best Value Schools, and #2 for Best National Universities. Learn more about the International Business PhD Program at Harvard University here. The Wharton School of the University of Pennsylvania was the world’s first collegiate school of business and was founded by industrialist Joseph Wharton in 1881. Wharton’s goal was for the school to produce graduates that would go on to become “pillars of the state, whether in private or in public life.” Accredited by the AACSB, Wharton is currently home to 2,559 undergraduates, 1,775 MBA students, 445 EMBA students, and 214 Doctoral students. U.S. News and World Report ranks Wharton #1 (tied) for Best Graduate Business Schools, #7 for Best Graduate International Business Programs, and #8 for Best National Universities. Learn more about the International Business Phd Program at the University of Pennsylvania here. Founded in 1898, The University of Chicago Booth School of Business has been providing graduate level education to students for over 110 years. Their global body of alumni now totals over 51,000. The Booth School of Business is accredited by the AACSB and offers degree and open enrollment programs on three continents. The Econometrics and Statistics program from the Booth School of Business allows students to tailor their individual program of study by selecting from specific areas of business, such as economics, finance, accounting, marketing, or international business, with advanced courses in statistical methods. U.S. News and World Report ranks The Booth School of Business #3 for Best Graduate Business Schools, #18 for Best Graduate International Business Programs, and #3 for Best National Universities. Learn more about the International Business PhD Program at the University of Chicago here. The University of Michigan was founded in 1817, and the Stephen M. Ross School of Business was later established in 1924. UM is an accredited member of AACSB International and at present has a student population of 43,651, with a student-teacher ratio of 12:1. The PhD program from Ross School of Business is a joint degree program in Business and Economics, designed for students with interest in business related fields like Labor, Environmental, Health, International, and Development Economics. U.S. News and World Report ranks The University of Michigan #11 for Best Graduate Business Schools, #27 for Best National Universities, and #4 for Top Public Schools. Tuition: Michigan Ross provides full funding to all students admitted to the doctoral program. It provides five years of funding, which includes a full tuition waiver, health insurance, and a generous stipend package that combines both fellowship funding and a graduate assistantship. Learn more about the International Business PhD Program at the University of Michigan here. The UCLA Anderson School of Management was founded in 1935 as the College of Business Administration. Anderson is home to The Gerald Loeb Awards for Distinguished Business and Financial Journalism, a legacy of financier and founding partner of stock brokerage firm E.F. Hutton, Gerald Loeb. The Global Economics and Management PhD from UCLA Anderson has a strong focus on international economic issues, so strong that third year students are encouraged to spend a quarter overseas, working on an independent research paper. U.S. News and World Report ranks UCLA Anderson #15 for Best Graduate Business Schools, #12 for Best Graduate International Business Programs, and #2 for Top Public Schools. Tuition: For the first four years, students are given fellowships to cover all tuition and fees, including non-resident student tuition (NRST). In the fifth year, student fees are covered by TA appointments, which provide fee remissions and a salary. The McCombs School of Business was established in 1922. Today it is a fully accredited member of the AACSB and annually educates more than 6,000 undergraduate, MBA, MPA, and Ph.D. students. McComb’s doctoral program in Finance focuses on a core set of subjects and then allows students to further specialize in one or more of the following areas of study: Corporate Finance, Investments, Financial Intermediaries, International Finance and Real Estate. U.S. News and World Report ranks McCombs School of Business #17 for Best Graduate Business Schools, #14 for Best Graduate Finance Programs, and #56 for Best National Universities. Learn more about the International Business PhD Program at the University of Texas at Austin here. Established in 1916, the Max M. Fisher College of Business has 8,027 current students. Students at Fisher seeking a PhD in Business Administration can select an area of focus from Human Resources, International Business, Organizational Behavior, or Strategy and Entrepreneurship. The Fisher College of Business is a fully accredited member of the AACSB and has a student-faculty ratio of 19:1. U.S. News and World Report ranks the Max M. Fisher College of Business #27 (tied) for Best Graduate Business Schools, #54 (tied) for Best National Universities, and #16 (tied) for Top Public Schools. Tuition: The Fisher College of Business provides admitted students with four years of funding, as long as satisfactory progress is made from year to year. Funding includes full tuition waiver and a monthly stipend. Learn more about the International Business Program at Ohio State University here. The University of Washington’s Michael G. Foster School of Business was founded in 1918. The PhD program at Foster allows students to (with guidance from faculty members) create their program of study, which includes major area of concentration such as: Accounting, Finance, Information Systems, Management, Marketing, Operations Management, and Technology Entrepreneurship. Students interested in International Business typically choose one of the aforementioned major concentrations, while minoring in International Business, and choosing to write an internationally oriented dissertation. U.S. News and World Report ranks Foster #27 (tied) for Best Graduate Business Schools, #54 (tied) for Best National Universities, and #16 (tied) for Top Public Schools. The Michael G. Foster School of Business is a fully accredited member of the AACSB. Tuition: Is waived as part of the RA/TA funding/stipend. A portion of it has to be paid by the student, about $420 per quarter that the school is not allowed to cover. Learn more about the International Business PhD Program at the University of Washington here. The Richard J. Fox School of Business and Management was established in 1918 and is the business school of Temple University. The Fox School of Business is an accredited member of the AACSB, and offers a PhD in Business Administration with 10 concentrations, including: Accounting, Finance, Decision Neuroscience, Marketing, and International Business. The program requires the students to combine their concentration with a complementary business minor, such as strategy, marketing, or finance, in order to establish an interdisciplinary approach to research. U.S. News and World Report ranks the Fox School of Business #32 (tied) for Best Graduate Business Schools, #118 for Best National Universities, and #56 for Top Public Schools. Students admitted to this program are considered for full financial support for up to five years. Funding typically comes in the form of research or teaching assistantship and includes full tuition and a competitive stipend. Learn more about the International Business PhD Program at Temple University here. Established as the Graduate Research Center of the Southwest, which was renamed to the Southwest Center for Advanced Studies (SCAS) in 1967, the school officially became The University of Texas at Dallas on June 13, 1969. A fully accredited member of the AACSB, the University of Texas at Dallas has a student population of 24,554, and a student-faculty ratio of 21:1. The PhD program in International Management Studies (IMS) from UT Dallas focuses heavily on scholarly analysis of international, strategic and organizational management issues. Students in the program can select from four majors and minors: Entrepreneurship, International Business, Organizational Behavior, and Strategic Management. U.S. News and World Report ranks UTD #38 (tied) for Best Graduate Business Schools, #146 for Best National Universities, and #74 for Top Public Schools. Learn more about the International Business PhD Program at the University of Texas at Dallas here. While originally chartered as the Maryland Agricultural College (MAC) in 1856, the school would go on to become the University of Maryland in 1920. 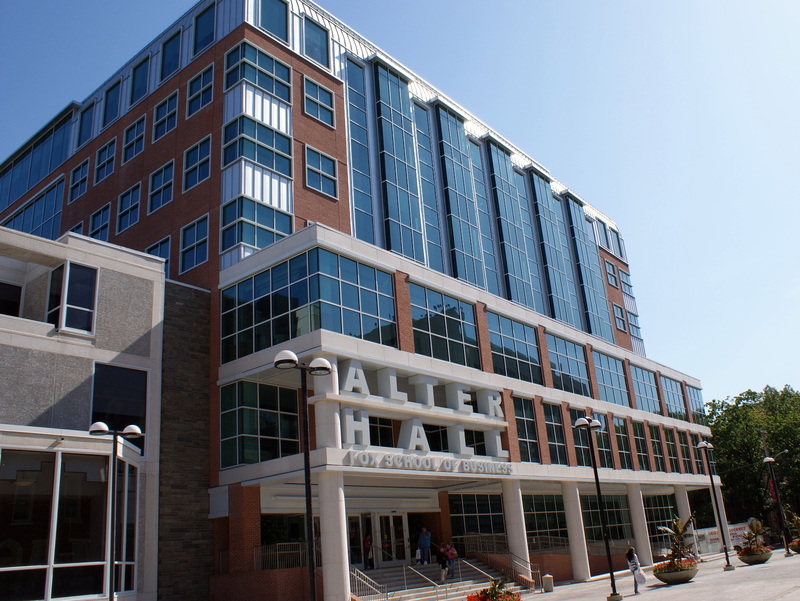 A fully accredited member of the AACSB the University of Maryland – College Park has a student population of 38,140 and a student-faculty ratio of 16:1. The Robert H. Smith School of Business offers doctoral degrees in eight fields of study, including: Accounting & Information Assurance, Finance, Managerial Economics, and Operations Management/Management Science, as well as offering a minor in International Business. U.S. News and World Report ranks the Robert H. Smith School of Business #47 for Best Graduate Business Schools, #60 (tied) for Best National Universities, and #20 (tied) for Top Public Schools. Learn more about the International Business PhD Program at the University of Maryland – College Park here. Purdue University was founded in 1869, as part of the Morrill Land Grant Act, and thus was dedicated to teaching agriculture and the “mechanic arts.” When classes began in 1874 there were six instructors and 39 students, today Purdue has more than 40,000 students and a student-teacher ratio of 12:1. The Economics PhD program from Purdue University’s Krannert Graduate School of Management offers course sequences for each of its 12 specializations, including sequences for both applied and theoretical International Economics. Krannert is an accredited member of the AACSB and is ranked #50 for Best Graduate Business Schools, #60 (tied) for Best National Universities, and #20 (tied) for Top Public Schools by U.S. News and World Report. Learn more about the International Business PhD Program at Purdue University here. Rutgers University was founded in 1766. It is one of only nine colonial colleges established before the American Revolution, and is the eighth oldest college in the nation. Rutgers Business School -Newark and New Brunswick was established in 1929, and is an accredited member of the AACSB. The International Business PhD program from Rutgers draws heavily on works in other fields, specifically: Economics, Management, Organization Theory, Science and Technology Studies, and Political Science. The program requires 72 credits to complete, 18 of which are dissertation research. U.S. News and World Report ranks Rutgers – Newark #50 for Best Graduate Business Schools, #135 for Best National Universities, and #64 for Top Public Schools. Learn more about the International Business PhD Program at Rutgers University here. The University of Miami was chartered in 1925. When it began its first classes in 1926 there were 646 students enrolled full-time, today UM has a student population of 16,825 and a student-teacher ratio of 12:1. The University of Miami is an accredited member of the AACSB, and its Department of Management offers a PhD program in the areas of: Operations Management, Organizational Behavior and Strategy/International Business. U.S. News and World Report ranks the University of Miami #57 for Best Graduate Business Schools, #44 for Best National Universities, and #27 for Best Colleges for Veterans. Learn more about the International Business PhD Program at the University of Miami here. The Darla Moore School of Business at the University of South Carolina was founded in 1919 and is fully accredited by AACSB International. Moore’s Doctorate of Philosophy (Ph.D.) in Business Administration program (With a concentration in International Business) is designed to help students develop the skills necessary to succeed in university research, teaching, business and/or government. U.S. News and World Report ranks USC Moore #71 for Best Graduate Business Schools, #107 for Best National Universities, and #49 for Top Public Schools. Learn more about the International Business PhD Program at the University of South Carolina here. This entry was posted in University Rankings on April 28, 2017 by rebecca.